Hinduism is often difficult to comprehend due to its ancient origin, multifuriousness, vastness and absence of one authority. No book on Hinduism, therefore, can be complete. This book, however, tries to attempt a well-documented and holistic view of Hinduism from historical and sociological perspectives. It intends to serve as a basic introductory text. The presentation is based on a first-hand reading of Hindu scriptures in Sanskirt combined with knowledge of social sciences. The emphasis is on three major Hindu scriptures: the Bhagavad Gita, the Manusmriti and the Vedas, particularly the Rigveda. These three texts constitute the basic framework of Hinduism. This book provides adequate information about the three scriptures and discusses in detail terms such as gotra, jati, varna and dharma. It also discusses the issue of divine punishment for violating the dharma. The book provides a detailed history or the origin or the culture and religion that flourished along the Indo-Gangetic Plains. It discusses migrations, their impact and the emergent civilizations. The objective is to understand how the religion evolved with people. It also studies the recent developments, particularly the impact of science and technology with regards to the Hindu society. Whether the Rigvedic values are relevant today have also been explored. Born into a large family of orthodox Brahmanas, the author obtained his basic training in Vedic religion and rituals from his father, who was a high school headmaster and a scholar in Vedic literature. Higher education first in the University of Madras and later in the United States brought new perspectives to his thinking on religion. Although specialized in the academic discipline of geography, the author developed a special interest in social anthropology and ancient Indian history that helped him understand Hinduism better. After completing his academics career, he joined the Delhi School of Economics, University of Delhi, and spent nearly three decades in that institution. He was Professor and Head of the Department of Geography, University of Delhi, for well over a decade and held various other important positions in the university. After retirement in 1996, the author devoted all his time to the study of the Hindu scriptures in Sanskrit. The present work is the outcome of his labour for well over a decade. This book represents the outcome of my efforts to understand Hinduism which has many facets-from the most sacred spiritual tradition to the worship of demons and animal sacrifice. It has taken me decades to understand the totality of Hinduism and then articulate the end results of my learning process. I do hope that the book will help others to understand Hinduism better. My journey begins with early childhood when I obtained training from my family particularly from my father, who was a keen student of Linguistics, a scholar in Sanskrit, and a good critique of Hindu philosophy. As a child, I was used to Vedic rituals and the recitation of mantras. I learned the Devanagari script at the age of four. I remember my father reading to us Valmiki’s Ramayana verse by verse and then explaining to us their meaning. I went through the processes of upanayana and the annual upakarma and learned to do my daily sandhya vandana rituals, although I did not then fully appreciate their meaning. Sanskrit was very much a second language at home, since all my brothers and sisters learned Sanskrit at school and recited verses from the works of Kalidasa. I did study Sanskrit for a few years in school, but did not continue the course further. As I entered adulthood and college, I became an agnostic. I firmly believed that all religious rituals are a waste of time. I discontinued all rituals and went to temples only on rare occasions. I did all along believe in an abstract God, who I thought would not respond to my petty demands and prayers. I accepted full responsibility for all my failures and thanked God for my successes. After college and upon entering into employment in the academic field, I became a keen student of history, sociology, and social anthropology besides geography, which was my own area of specialization. Indeed, I was interested in all social sciences that made me read widely. & a student and as a teacher in Indian and foreign universities, I had access to excellent reading material and I took full advantage of it. I read about Hindu religion, other religions, and western philosophy. Much of this had nothing to do with what I taught at the universities nor my own research and publications. This was done purely for personal satisfaction. Still later, as I approached retirement, I made up my mind to learn Sanskrit afresh and study the Hindu scriptures. This was my way of keeping my mind and intellect occupied after retirement. & a preparation for this, I bought books on Sanskrit grammar together with an advanced dictionary. After retirement from the University of Delhi in 1996, I devoted full time to the learning of Sanskrit grammar. Bhandarkar’s two books on Sanskrit grammar was the foundation on which I obtained a grasp of the language. This was supplemented by books in Malayalam script on Sanskrit grammar. Malayalam was the medium of instruction while I was in school. Further, most Hindu scriptures in Sanskrit are available in the Malayalam script with translations and explanatory notes in many cases. My familiarity with both the Malayalam and Devanagari scripts was of great advantage to me. The learning of Sanskrit grammar took two years, but it was time well spent; the reason is that to obtain a dear and unbiased understanding of the scriptures one has to study the original texts in Sanskrit. There is no short cut. After two years, I was ready to read the original Sanskrit texts. My first choice was the Bhagavad Gita with Sankara bhashyam in Sanskrit prose. I got a copy of the Bhagavad Gita in Devanagari script with the bhashyam. I devoted two years to the study of the Bhagavad Gita. It was a difficult exercise. I greatly appreciated Adi Shankaracharya’s explanations, verse by verse. It tells us the essence of the spiritual path that all of us have to follow, at least to the extent possible. The next step logically was to look into the Manusmriti which focusses on the practice of religion; it has more to do with the social system, rather than the metaphysical aspects of religion. The Manusmriti is nearly four times larger than the Bhagavad Gita; however, it is much easier to read and understand, since it deals with day to day life. It is written in a simple and straight forward style. At first, I had a negative view of the Manusmriti; but later, I realized that I am looking at it through coloured glasses. It is about a society that is no longer extant. It did play a major role for over 2,000 years and until the beginning of the 20th Century. But we cannot understand the past without reading the Manusmriti and its description of Hindu dharma. There are several texts of lesser importance which I read (in Sanskrit) more casually as and when time permitted. Among such texts of importance are the Brahmasutra, Kathopanishad, and Pantanjali Sutra in translation, an anthology of important verses from the Upanishads, and the well-known Yaksha Prasna. After completing the study of the above classics, I strongly felt that I need to go to the roots or origin of our religion and trace its evolution. 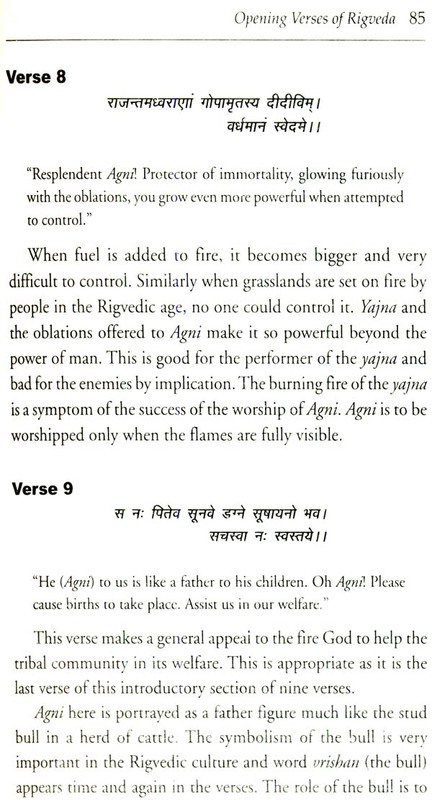 For this, one must study the Rigveda. Fortunately, a friend gifted me a copy of the four Vedas-in four volumes- consisting of the mantra part alone. I was, in particular, fascinated by the Rigveda. Understanding and appreciating the Rigveda is impossible without some understanding of social anthropology, since we are dealing with a tribal society that existed about 3,500 years ago. My knowledge of social anthropology and ecology helped me greatly to understand and appreciate the Rigveda. I interpreted the Rigveda essentially as a study in human ecology of a bygone age. The Rigveda has no parallels in any other religion. It is not mythology. It is pure religion in verses composed by poets, who were human beings with real names and who lived a long time ago. All other Shruti texts are also real but they include some legends as well, while the Puranas represent true mythology. Upon completion of my reading of the Rigveda and the other three Vedas, I reached a stage when it was necessary for me to put down in writing what I had learned. I did this over a long period of time - years in fact. Starting with an enquiry into the nature of Hinduism, I moved on to an article on a synoptic view of the evolution of Hinduism, before attempting articles on the substantive works. Eventually, I ended up with 21 articles divided into two parts-the religious part and the social part. These articles were suitably modified and put together in the form of the present book. In my experience, I have found no work in the English language that gives an authentic introduction to Hinduism. I have tried to achieve two objectives in this book. The first objective is to provide a historical and social frame of reference for understanding Hinduism. The second objective is to give an authentic overview of three scriptural texts, namely, the Rigveda, the Bhagavad Gita and the Manusmriti. These three texts define Hinduism both in terms of its religious and social dimensions. Further, I have added a few chapters to focus on contemporary issues, such as our caste system and the impact of science and technology. Above all, this is a holistic exposition of Hinduism. It is my belief that those who have never had an opportunity to read religious texts in original will find this book very useful. Writing a book requires inspiration and I owe this largely to my brothers and sisters, all elder to me, who have themselves read the Sanskrit texts and are conversant with all religious concepts and rituals. My contribution has been the interpretation of Hinduism in the light of my knowledge of social sciences. From the start, I circulated my papers by email, not only to my brothers and sisters, but a much larger audience of relatives and friends. I am thankful for their words of encouragement and at times criticism. In November 2006, I gave an open lecture on the evolution of Hinduism, as part of a short series of lectures on the Historical Geography of India, in the Department of Geography, Delhi School of Economics, University of Delhi. The response to my lectures overwhelmed me and the idea of publishing this work originated at that point in time. Dr Anu Kapur, a former student and a member of the faculty, insisted that I take steps to get the book published and the present work owes much to her help in this regard. I am indeed grateful to all my friends, former colleagues and students of the University of Delhi for their enthusiastic support. I do hope that they will enjoy reading this work as much as I have enjoyed writing it. The origin of mankind, according to modern science, occurred in Africa about 60,000 years ago and from there people migrated to all parts of the world. The Indian Subcontinent received its first batch of migrants only about 12,000 years ago. From this date onwards, we have archaeological evidence of human habitations in some parts ‘of the subcontinent. These early inhabitants practised agriculture and animal husbandry and they buried their dead, thereby indicating that they practised some form of religion. Migrations of people into the Indian Subcontinent occurred from several directions-from the west along the Makran coast (modern Baluchistan and Iran), and the various mountain passes of the north-west; from the north by way of Tibet; and finally from the south by way of Burma. These migrations occurred periodically and continued up to the Middle Ages (1600 AD). The subcontinent’s oldest civilization, namely the Harappan Civilization, which dates back to 2500 BC, has made significant contributions to the present day religious belief and practices. The Harappan script has not been deciphered so far and hence the elements of the Harappan culture and religion have come to us indirectly through an oral tradition. They were later transformed into a written tradition, first by the Buddhists and Jainas in the Pali language and later by Brahmanas in the Sanskrit language. The Rigvedic people constitute a very important migratory group who came to the subcontinent at around 1500 BC. They made an impact far greater than their numbers would warrant. The reason for this is that they memorized their religion in the form of verses and preserved not only their religion but also their language, that is, Sanskrit, for posterity. Sanskrit, however, ceased to be a spoken language around 1000 BC while its importance as a literary language continued for about 2,000 years. What is notable here is that many other groups of people also came to India in later periods and today they constitute the majority of the population of the region west of the Ganga River. Religion is as old as mankind. The earliest migrants as well as those who came in the later periods to the subcontinent had their religions. Many of these religions or at least some of their religious practices have continued into the present through an oral tradition. These are clearly evident in rural India even today. Around 600 BC, two other major religions of India came into being, namely Buddhism and Jainism. They also have significantly influenced religious belief and practices in India in later time periods. Buddhism and Jainism are well documented and are traceable to historical persons. This period also witnessed the demise of the Rigvedic religion and in its place the emergence of two major schools of thought-the Poorva Mimamsa school and the Uttara Mimamsa school. The former, founded by Jaimini, the disciple of the great Rishi Veda Vyasa, is well illustrated in Manusmriti, while the latter represents the religion of the Upanishads, which is later expounded in the Bhagavad Gita. From around 200 AD, we find the emergence of a new religion in the Sanskrit language. The texts describing this religion are known as Puranas. They also include the two great Indian epics-Ramayana and Mahabharata. This religion is known as Hinduism. Where does the word ‘Hinduism’ come from and what does it mean? The term ‘Hinduism’ does not occur in any Sanskrit text. This word is of Persian origin and it was extensively used by the medieval rulers of India, who used Persian as their court language. The word ‘Hindu’ was first applied to the people of India in general and later to its religions as well. Hinduism became the most accepted name for the religion(s) of India during the British period and today it is accepted by one and all. Nevertheless, there are a few who would like to call this religion as dharma or sanatana dharma. These two terms can be traced to the Manusmriti. This classic text of social laws is no longer acceptable to the majority of Indian people and as a result, the suggested terms are ignored by a large majority of Hindus. The word Hinduism includes not only the religion(s) based on Sanskrit texts, of which we have a large number, but also the hundreds of religions of rural India which have come down to us through oral tradition and whose origin, in a number of cases, is older than the religions represented in the Sanskrit texts. The importance of Pre-Rigvedic religions to the totality of Hinduism has largely been ignored in the past. In Manusmriti, there are passing references to the religious practices followed by the Shudras. Manusmriti’s dharma is largely meant for the upper three varnas-Brahmana, Kshatriya and Vaishya-and it hardly attaches any significance to the religions or religious practices followed by the Shudras. Hinduism is a unique religion. There never was a concept of religious conversion in Hinduism. The religious beliefs, rituals and associated social practices can vary greatly among Hindus. Yet there are certain common ideas, beliefs, and practices acceptable to all. Unlike other religions, Hinduism does not insist on conformity and a Hindu has absolute freedom of thought. There never was a controlling authority in Hinduism. The practice of Hinduism is purely voluntary. The term ‘Hinduism’ will be used in this work as a collective noun; it represents several religions which are in some ways very similar to each other. Hinduism stands in stark contrast with the major religions of the Middle East. Christianity and Islam are based on a messenger of God, while Hinduism does not have a historical person as its originator, although many made significant contributions to it. Again, unlike Hinduism, both Christianity and Islam have definite religious texts-the Bible and the Qur’an-which are sacred and sacrosanct. Another notable aspect is that the religions of the Middle East display little tolerance towards other religions. Islam preaches good Muslims to convert people to Islam. Evangelization is a common feature in Christianity. At the birth of Christianity and Islam, there were numerous other faiths. However, majority of these have now vanished. Yet pagan beliefs and practices do exist even among Christians and Muslims in various countries even today. These are grudgingly tolerated at best. Hindus do have several scriptural texts. We have the four Vedas, namely Rigveda, Samaveda, Yajurveda and Atharvaveda, the Upanishads, and the Bhagavad Gita. All these are written in Sanskrit. The fact of the matter is that few people know Sanskrit and even fewer have actually read these texts. Unlike the Bible and Qur’an, our religious texts are not published in large volumes; nor are they translated into modern Indian languages. An English translation of the Rigveda does exist but ironically, it is very difficult to obtain a copy of the oldest and most sacred Rigveda. In India and East Asia, a wide variety of religions co-exist without acrimony. In rural India, different jatis in the same village follow different religious practices and worship different Gods. Many religions based on Sanskrit co-existed with a variety of other religions from pre-historical times. In the past, they had separate identities but now they share a common name. However, a common name does not mean uniformity. There was no stress on uniformity and other religions, sects and cults in Hinduism co-existed peacefully in the same region. Hinduism is very unique, positive and liberal and has hardly any rigidity associated with Middle Eastern religions. It is open ended and broad based, allowing greater flexibility and individual freedom. In China, the question what is your religion would most likely not be answered at all. This is true of Japan as well. People follow Taoism, Confucianism, Buddhism, or Shin to ism but refuse to be tagged. It is impolite and rude to ask such persons to name their religion. The situation is more or less similar in India; the Hindus do give a ready answer, however, it can have plethora of meanings. Hinduism is not a single religion but a mixture of many religions. The label ‘Hindu’ is really unimportant; the important ones being concepts, beliefs, and practices. Despite these, there exist profound similarities, sharp dissimilarities and utter variance in religious beliefs and practices among all Hindus in India. But the question is how can we understand these complexities. I have tried to simplify the situation by recognizing two admittedly artificial categories of Hinduism. The first, but not necessarily in that order, are the religions based on Sanskrit texts; and the second, hundreds of local religions which do not have a religious text but have legendary Gods of their own and age-old forms of worship. These include the Harappan culture and its successors. The worship of God Shiva and Goddess Shakti, animals, stones, trees and host of spirits have their roots in the pre-Rigvedic culture. Bhakti and puja, as forms of worship, were alien to the Vedic age. The forms of worship practised today may have come forth either from pre or post-Rigvedic era. However, I have focussed only on the religions that existed before the Puranic period (before 200 AD) as revealed by Sanskrit texts. The Puranic religion based on Sanskrit texts represents an integration of the earlier Sanskritic religions with a number of non-Sanskritic religions of India. This point will be elaborated upon in a subsequent chapter. The objective of this book is to present my understanding of Rigvedic religion and its two successors, that is, the Poorva and the Uttara Mimamsa school, according to the original Sanskrit texts. The interpretation is based on my knowledge of social sciences, particularly ancient Indian history and social anthropology. It is intended to present them as they existed at the time of their origin and not in the form in which we understand or use them today. Unlike the Middle Eastern religions, Hinduism has evolved from prehistoric times to recent times through a gradual process of change. A religion can be understood only in the context of the social conditions of the time in which it was actually in vogue. We have an excellent account of the society and religious practices around 300 BC in the Manusmriti. This classic and valuable historical document has been reviewed in depth in this book in order to get an insight into the society of the pre-Puranic age. In fact, Manusmriti should be used as a yardstick to judge religions and societies before and after its time. Organization of Book-This book is divided into two parts; the first deals with religious issues and the second focuses on the social aspects. In the first part, the nature of Hinduism is examined, followed by a synoptic view of its evolution from Rigvedic times to its current state. Three chapters are devoted to the Rigveda, which represents the root of Hinduism based on Sanskrit texts. The religion that emerged in the later Vedic period is then interpreted. This religion is rather unique, as it differs from both the Vedantic school as well as the Poorva Mimamsa school. This is followed by a summary of the Bhagavad Gita in four parts-a synthesis of various schools of thought presented in the Puranic story-telling context. Nevertheless, the Vedantic school’s thinking predominates over all the other schools of thought. This religion is known as the Upanishadic religion and was interpreted by Adi Shankaracharya in 8th Century AD. This part concludes with a review of Bhaja Govindam, where Adi Shankaracharya renders advice to all householders. This is valid even today as it was in 800 AD. The second part begins with the origin of the Indian Subcontinent, particularly the Indo-Gangetic Plain, and further examines the historical and pre-historical evidence of human habitations, migrations, and emergent civilizations in the subcontinent. Three chapters are then dedicated to the Manusmriti, which outlines the varna, ashrama, dharma, raja dharma and finally the issue of divine punishment for violating dharma. These chapters stand apart from the subsequent ones, focussing on a particular time in the Indian history and informing about the society that existed then. The later chapters focus on the current day society in India, as understood in relation to the past and hence the relevance of the Manusmriti. The chapter also explains the caste system in India, both in terms of its historical origins and its contemporary relevance and importance. The terms jati, varna, and gotra are all examined in depth and the confusion that the term ‘caste’ raises has also been resolved in the chapter. Like the word ‘Hindu’, the word ‘caste’ also has multiple connotations and it is necessary to fully comprehend the differences in meaning when using this term. Births and deaths are integral to any religious discussion. In the chapter on janma, karma and bhaga, the relative importance of birth, human action through the exercise of free will, and the chance factor are analysed. India has now emerged as a world leader. It has a rapidly growing economy based on science and technology. India has been going through a scientific industrial revolution for the past 150 years. What impact does science have on religion and in particular on Hinduism? What is the prognosis? This aspect is addressed in the chapter on society, religion, and science. What do Hindus believe in today? This is too difficult a question. Nevertheless, one can make a few statements on what educated Hindus believe in today. However, opinions may vary as these statements may be considered true or false. If faith is the basis for defining a religion, then it is possible to define a Hindu in terms of what he believes in. Fortunately, such a definition exists in the Bhagavad Gita. This is reframed in a slightly different form in a chapter on the definition of Hindu. The concluding chapter of this book looks at the future scenario and what one can learn from the study of the past. Hinduism has many ideas to offer to the world. Nevertheless, religion is a personal matter and every individual may choose what is relevant to him or her. This study represents an exploration of religious ideas expounded in ancient Sanskrit texts and these are presented here in their original form without bias or distortion. The objective of this book is to help the reader to form his own appreciation of the Hindu religion.